Weapons are transformed into chairs. Copyright the artist and Jack Bell Gallery. We first came across Goncalo Mabunda's sculptures a few years ago, and immediately loved them. 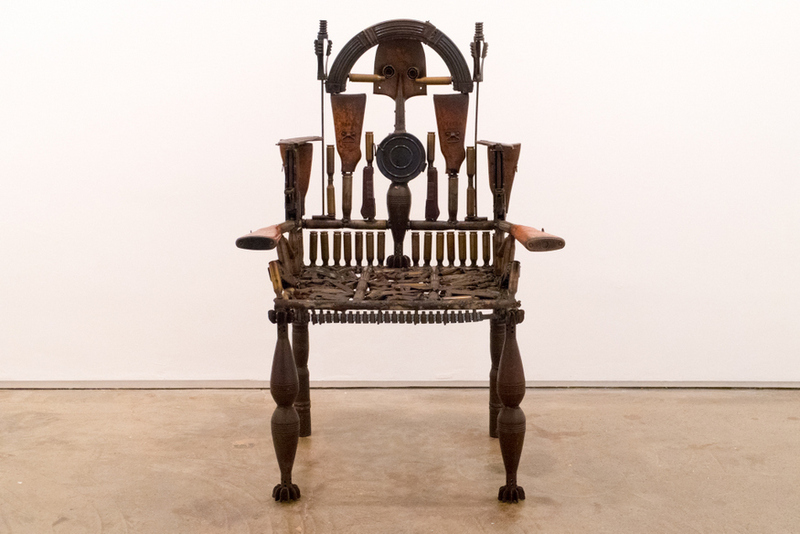 He creates chairs made of decommissioned arms, including AK-47s, rocket launchers and pistols. They are visually arresting sculptures but there's a deeper story behind them. Mabunda's native Mozambique was involved in a 16-year civil war, which only ended in 1992. The arms were recovered from this conflict and Mabunda has re-purposed them. These chairs may be made out of weapons of war, but they are a message of peace. The artist is showing that from terrible objects, art can be made. It's both his way of dealing with the conflict and highlighting the resilience of his country in its ability to recover from war. This exhibition will display his latest work at the hidden away Jack Bell Gallery in Mayfair. Goncalo Mabunda: New Work is on at Jack Bell Gallery, 13 Masons Yard, SW1Y 6BU until 22 June. Entrance is free and the gallery is open Tuesday to Saturday. The gallery entrance is the green door behind the White Cube gallery.